Is anyone else fed up with the weather playing absolute havoc with their Saturday fixture plans. I mean for a man who writes about football pies it’s been a minor inconvenience, if anything it has expanded my horizons as I go to games that would have been consigned to sporting history as I followed my team across the country. These ever burgeoning horizons I find myself heading towards resulted in my first pie related television appearance on The Riverside Show last week. It was a surreal, but thoroughly enjoyable, experience and one that perhaps reignited a fire that had been dampened somewhat as the grind of real life meanders oh so slowly by. I don’t know if this means that I’ll be taking David Currie’s job on Sportscence any time soon but maybe, just maybe, I can find a way to get paid for all of this. I’ll never go begging and I’d like to think that the initiative (something that is forever championed as the best way to get your foot in the door) this project has shown will one day illuminate my path to, what some would call, legitimacy. For now though I’m happy enough with the path that these pastries has led me on. Anyway we all know why we’re here, so without much further ado, let’s rate some pie! Looking at this you wouldn’t think there was hardly a game on that day! Now before I get too deep into this, I went to this game knowing that I had previously had a pie from the very same venue, one of my earliest reviews, Pie 16: The Petershill Pie and to be honest it didn’t go very well. Now retrospect suggests that having a tequila based hangover may have had a slightly adverse effect on my review but I still know that some things were fundamentally wrong and I was curious to see if much had changed from my visit 16 months previously. 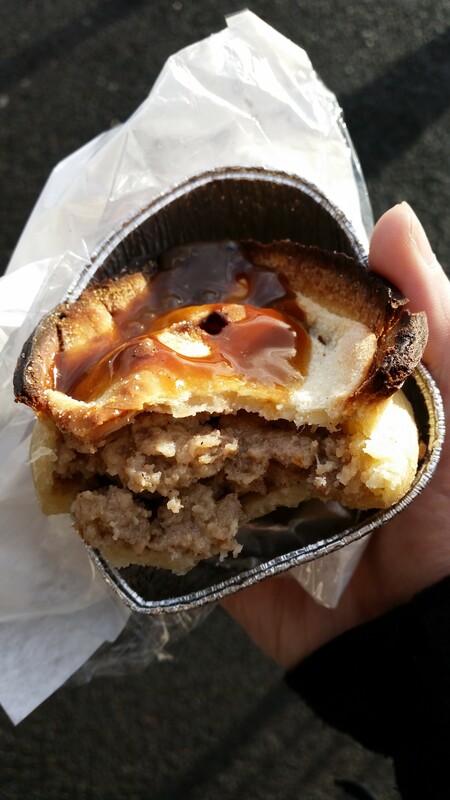 Price: At £1.50 it was the top end of the junior scotch pie price spectrum but still reasonably priced for a football based pastry snack. Presentation: On my last visit I bemoaned the use of a plastic and paper bag to store the pie in and once again I was presented with a pie in such a reciprocal. However differing from previously this pie was also surrounded by a tin foil sheath. Not a big deal I hear you say, but this aluminium shield stopped the pie in its entirety steaming against the plastic. I don’t know if there is a reason for the bags at Petershill Park but people’s pie lives would be enhanced further if the bag was taken out of the equation. There were some small white napkins available of the self-service variety for mopping your mouth with. Meatiness: This pie was a well-formed, safely seasoned scotch pie. The filling fell apart a little as I chewed my way through and I was pleased to feel a peppery linger on my palate that slowly built up as I neared final consumption. It wasn’t anything mind-blowing, it hit all the key points a decent pie should without moving on to the next level but it was definitely a marked improvement on the pie I had experienced the last time I visited the north of Glasgow. Pastry: As can be seen the top edges were rather crispy. Well OK, they were burnt meaning that there was a slight bitter undertone to each bite. I’m sure if I visited another time this extreme crispiness would not have occurred. I previously mentioned how the tin foil case had helped reduce the moisture inside the bag however sadly there was still a slightly soggy bottom to this pie, however if you mixed it with the well fired top the texture was probably just right! Brown Sauce: Wee sachets of mass-produced no-name sauce. Did the job. 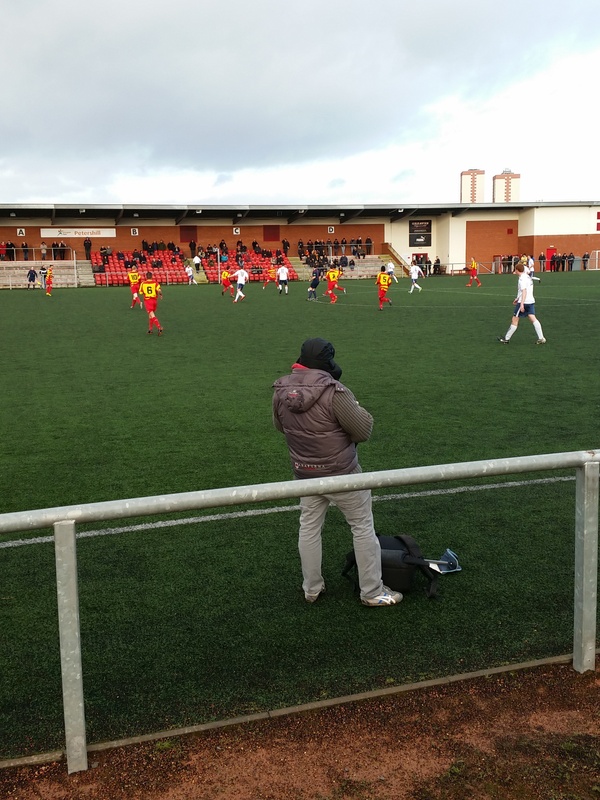 Overall: A better effort from Petershill Park, and perhaps Rossvale deserve individual credit for providing their own pies. I’d love to know the right answer. That said it was a little burnt on top and a little soggy on the bottom but had an overall good pie flavour. Gravy Factor: Bog Standard Bisto. Just take it out the oven a bit quicker next time. I literally have no idea where my next review will emanate from. Last week I was so convinced that my scheduled game would be on I got so sozzled on the Friday night that come the news that it has indeed been called off I was in no real fit state to drive. What I can assure you of though it will most definitely be pie number 88. However, until then go forth and eat pie! This entry was posted in Football Pies, Junior Pies, Sporting Pies, The Life of Pie and tagged fitbaw, Football, Gravy, Juniors, Meat, meat filled pastries, mince, musselburgh athletic, mutton, pastry, petershill, Pie, rossvale, scotland, scottish junior cup, stv, stv glasgow. Oh aye Rossvale 3-5 Musselburgh Athletic. I need to figure out where best to slot that in!